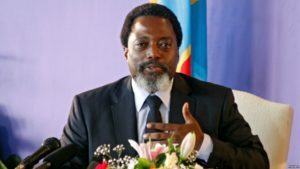 President Joseph Kabila of Democratic Republic of Congo on Thursday said a presidential election in December would go ahead as planned but he declined to say whether or not he intends to enter the race. Congo, which is nearly the same size as Western Europe, is in the grip of a crisis over whether Kabila will run in crucial, long-delayed elections in December although his constitutional limit expired in 2016. Candidates must declare their bid between July 25 and August 1. According to Kabila, the government would finance the elections itself so as to avoid “blackmail” by foreign powers that have criticized repeated delays to the vote. A law adopted by parliament on Wednesday includes post-presidency perks, including a pension, housing, security, health care and a diplomatic passport. Former presidents already enjoy considerable legal immunity under the constitution. The United Nations says $1.7bn is needed to avert a catastrophic humanitarian crisis in DR Congo. The government says the UN is exaggerating and giving a bad image of the country. The UN Security Council and the African Union Peace and Security Council, on Thursday, “expressed concern about remaining challenges to foster greater confidence” in the electoral process. Posted by Geraldine Boechat on July 20, 2018. Filed under News. You can follow any responses to this entry through the RSS 2.0. Both comments and pings are currently closed.